It was a squirrely day out there, but we remembered the battens this time and got the new mainsail hoisted for the first time. I had no idea how great a new sail would be. But let’s back up. It’s rare to have a day of triumphant victories without some pathetic moments sprinkled in to keep a sailor guessing. Sustained westerly winds over the last few days had pushed a lot of the water out of the bay, which we fully understood only after getting to the point where we could neither get the boat back on the trailer nor out into floatin’ water. With the help of the motor, a boat hook, and a marina guy pulling on our dock lines, we essentially portaged the boat out to the end of the dock. The wind at this point was non-existent—maybe a Force 1 on the Beaufort Scale. I thought it might be tough to actually give the new mainsail a valid test, but the forecasts were for it to pick up to 9-12kts later, and at least this lull would allow for a relaxing ceremonial insertion of the battens in calm air. 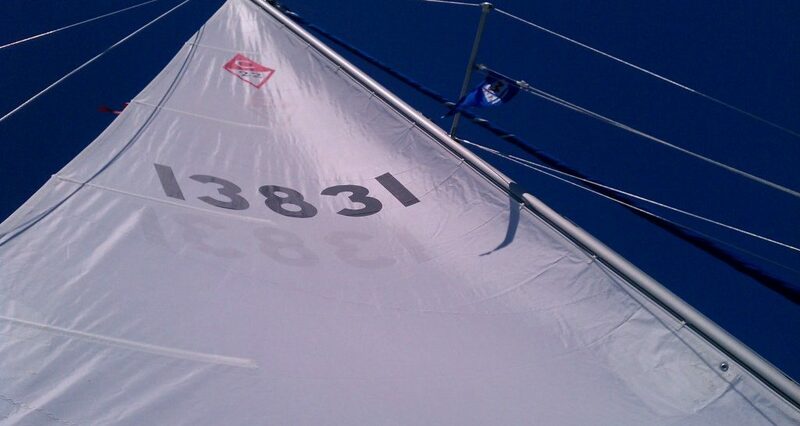 Except that literally as we touched the sail, the wind piped up enough to make handling the sail on deck annoying. We persevered, and got it sorted out without flogging the sail—it would have been far more convenient to just raise the sail as we went to add the lower battens, but we we’re trying to be very careful and didn’t want it to flutter needlessly, since that’s bad for sails. We had enough water to get out of the cove and we lowered the keel and rudder when we got out into bay. Jen then manned the halyard and hoisted the main, marking the first time we’d actually seen all of it at one time. I had obsessed over buying a new sail for a long time, and was eventually convinced by the online sailing community that it would be a noticeable improvement, although I had no context for knowing what that meant. All I can say is that they were right. It’s like a new boat. I was overshooting tacks by 20° because for the first time ever, we can actually point. We had the weather vane inside the reference tabs on the windex (that is not the fastest way to sail, but was previously impossible.) Also, our sail controls actually worked. Our outhaul made obvious and dramatic improvements, as did the vang. I could see the sail twist and the draft position and actually change it. I bought a cunningham hook three years ago and have never used it, but now I’m going to try. And although I was warned that I shouldn’t use the sail in high winds early in its life, we’d soon prove that we don’t heel as much and can leave a lot of sail up way longer than we ever could before. We had just deployed the jib and were getting reacquainted with sailing as a proper sloop again when Old Man Wind stumbled drunkenly through the saloon doors. We started getting gusts to 20kts (and even more ridiculously, not always from the direction of the prevailing wind (?)) and put the rail in the water a couple times before I struck the jib. The preponderance of whitecaps were indicating to me that we were in reefing weather, but without the jib Fortuitous got right back on her feet and we were sailing fast. I remembered back to the warnings about pushing a fresh sail, but I also remembered back to the manual of my first new car with a stick shift which cautioned against full throttle acceleration in the first 1000 miles, and I can tell you how that went. We were hauling. The most annoying thing was that it was cold. Neither of us had enough layers on for the wind which was surprisingly in our faces, so when we got down to BB we jibed and sailed back on a very broad reach, which was somewhat less annoying. Although sailing downwind doesn’t necessarily impart the same sense of speed, we were still sailing ridiculously fast (for us). I’m not saying that I trust the accuracy of our telephone-based GPS “system” but for a relative comparison, it usually says that we sail around 4 knots and change. Surfing down the waves coming back we hit 6.3, which is the highest number we’ve ever seen: on just the main. Things then generally unwound. The wind spontaneously shifted 90°, causing an accidental jibe (awesome for the new sail, I’m sure), then it died, then it came back in the mid-20s, 180° from the original direction. Then it kind of clocked all over the place randomly…check out the arrows on the wind history report. There were no clouds so I don’t think it was a front or anything like that, so I have no idea what was happening. I found myself wishing that I could have spoken to or punched a meteorologist. I thought I was using great seamanship by planning to arrive back at the dock at straight-up high tide so that we could more easily get the boat back on the trailer, but that was also thwarted. In the off season the ramp at the marina was widened 4ft and extended 6ft into the water, which should be a benefit for us since we’ve historically gone off the end of the ramp, but the downside of this is that the drop off between the end of the ramp and the start of the seabed is now, for whatever illogical reason, enormous. The water level was low enough that even at high tide the trailer wheels went past the end of the ramp, and my truck couldn’t pull the boat up over what they called “the curb.” The marina was extremely helpful though, and gave us an assist from the winch on their universal boat trailer, and that got us back up on the ramp. I’m not sure how this is going to work for the rest of the season. Hopefully they can figure out a way to back fill it a bit or something to ease the transition. Playful New Jersey pleasantries aside, the new main is awesome. Assuming we have water and more normal winds for the rest of the season, we should be set for some really good sailing. Great report, Chip. Your ability to closely observe the boat while sailing will really aid the process of getting your main handling skills to 100%, I’m sure. I’m glad your experience has validated the advice of your “virtual colleagues”. The picture shows a relatively untensioned main, something I would rig for 6-8 knots of steady, weakish air. It looks as if the halyard is about an inch slack, and that the leech line is a little slack, as is (but I can’t see it), the outhaul. Tightening the foot via the outhaul to flatten the sail (along with more halyard tension) is about the last alternative to a reef, as are helming to a close haul tack, feathering into irons in the puffs, or “wearing ship” which would be to let out the traveller entirely as one falls off to a broad reach, so that the boat more or less rotates around the boom, giving you great control as you stop trying to beat to windward. Or douse the jib, as you did! I find the fact that none of the standard mainsail controls worked properly suggests the main you replaced was in pretty dire shape. Now you know the difference, wait until you fully exploit the possibilities. Buying a new main may make you wait to consider keeping the whole boat, as it is now “refreshed”. Have fun and good luck with the trailer issues.